I think parents are constantly in search of products that will make our lives easier. Nothing is better than finding just the right thing that you will use frequently and that is easy to use and keep clean. As the cold weather is finally upon us, I was excited to try Nomie Baby’s toddler stroller blanket. This is an excellent product for getting out and about with your little one during the chillier weather. Nomie Baby’s tagline is “problem solving for parents” and this product definitely eased my mind on a recent outing to the zoo to see their annual Christmas lights display. This fleece-lined, wind resistant blanket looks and feels cozy straight out of the package. My first concern with products like this is will it be easy to use with my stroller. Gratefully, the answer is a resounding yes. The design is such that it makes it a snap to attach it to any stroller without having to read any complicated instructions. The top features an elastic band across the back that slips easily over the seat of your stroller. There are various slits along the back that accommodate the straps and buckles. I was able to get this on in a few minutes while standing in the dark parking lot of the zoo. I love how thoroughly it covered up my son, with plenty of room to grow in the leg area. He looked incredibly comfy and cozy the whole night and we could enjoy all of the lights without worrying about him catching cold. There was a light rain at the zoo and the exterior prevented the water from soaking through and reaching my son. A zippered pocket is located on the front of the blanket, perfect for storing small toys and other items you might need to keep handy. This product is as easy to remove as it is to set-up and it is machine washable and dryer friendly as well. 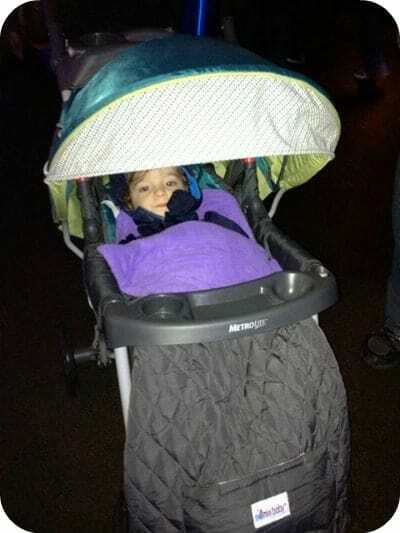 The toddler stroller blanket is available with either a blue or purple fleece lining. Both have a gray exterior which allows it to blend well with any color of stroller you may have. I love this product and look forward to being able to get out more this winter without having to layer my son’s clothes as extremely. This product is also available in infant sizes. You can find out more about this and other Nomie Baby products, including their award-winning car seat cover by visiting their website. My friend would love this. Thanks for the site. I really like their Infant Car Seat Covers too. This sounds like the perfect stroller blanket with its slitsand easily accessible pocket. He looks so snugly and warm! I would love to get one of these for my son. It would be great to be able to go out to the zoo or the gardens and not feel like your kid is freezing. Thanks for the review! My niece in England would love this as they walk a lot and sometimes it is too cold for baby! Great sounding product. Wish they had them when my girls were born. At least they are in time for my grandchildren though. This would be an awesome baby shower gift for my friends daughter. We live in Maine and winter can be very cold!! This looks like a practical product! I wish I’d known about it for all the holiday running around. Boy I didn’t know they even made anything like this! I wish I would have known about these when my son was still in the stroller! I was always trying to bring regular blankets to try to keep him warm when I took him outdoors! This looks great for my little girl! How wonderful that it is made to work with a stroller and protect your child from the wind. You are right…parents want products that will make their lives easier – we all do! We did it to solve a problem and be easy to use. Sounds like you found a winner! Enjoy your winter outings. I like the ease of the use of it. It sounds like it would come in handy. Thanks for the review. I have never heard of it before.